losing their lives. Five courageous frogs marched from that point for the competition.They had to reach the top and return back to the same point. Two of the frogs returned back after a few while giving up their hope discovering that was a difficult job. 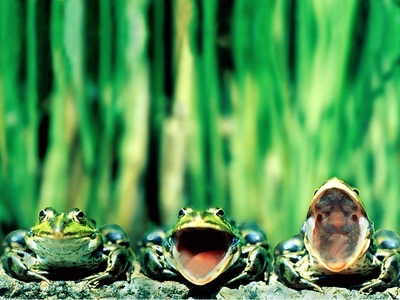 All others frogs were calling the three who were on their way. " Come back stupid frogs, it is none of your business and none of our ancestors have done that kind of risky jobs yet. You may lose your lives in the name of victory." After hearing the yell of the frogs one of them thought it was really the toughest game of his life and gave up the competition and returned back and mixed with the group. Again the group started to yell to return the competitor's frogs back to the point. " Don't lose your lives, come back soon, it not a competition, but you are going to the hell". After listening this yell one of the remaining frogs gave up and returned back to them. He mixed with the other frogs and again started to yell to make the remaining one competitor to return back. But regardless of their yell the last frog reached to the top of the rock and wins the competition. The other frogs started to yell again; "You reached there, but won't return back alive". But he arrived safely to the point. He became the bravest frog and other frogs surprised how that happened and why he didn't listen to them. They discovered lately that he was deaf and he didn't hear what they were crying. The lesson of this story; we human being is so jealous if we couldn't do something and believe it is impossible for everyone and discourage other not to do. People who don't listen what others say and keep on going only win the game in life.